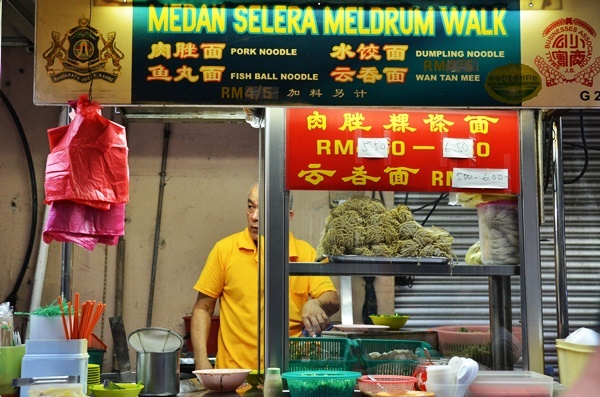 But it becomes more challenging (and interesting) to embark on a food hunt on foot to JB (Johor Baru for short); crossing the border and coming back with a bucketful of pleasurable memories. One useful hint is to go on a Saturday instead of a Sunday, as you could be stuck at the Customs or the Causeway with the homecoming crowd on Sunday evenings (and it is not a pretty sight). Even then, do make it a point to wake up earlier and travel to the checkpoint at Woodlands before noon; preferably even before 10am if you can afford to sacrifice the luxury of sleeping in. Well, the recent trip was a mixed bag of emotions; this was my first pilgrimage (if you will) from Singapore since I relocated to the Lion City 11 months ago, and this will also be my last before I leave Singapore in a month’s time for my next career move. But boy oh boy, was it a fabulous eating adventure crammed into a span of eight hours! We started off with an early lunch at Restoran Hua Mui near to City Square Mall; just after the checkpoint. Hainanese chicken chop served with a generous ladle of brown sauce, boiled green peas, tomatoes and fried potatoes. 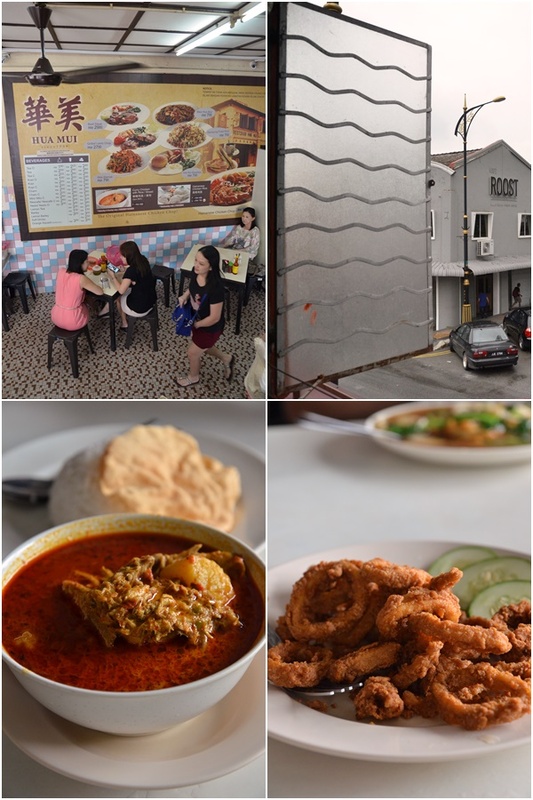 You can walk to this traditional Hainanese coffee shop; spanning two floors at the junction of Jalan Trus and Jalan Dhoby from City Square Mall; a less than 10 minutes’ worth of leg exercise. The more than half a century old establishment has stood strong throughout time and attracts a sturdy legion of fans from all over the place; both the local folks from all walks of life (this being a pork-free eatery) as well as the newer generation of visitors captivated by the charm of the mosaic-tiled floor, rickety wooden staircase and bright, airy ambience on the upper floor with fully-opened windows. 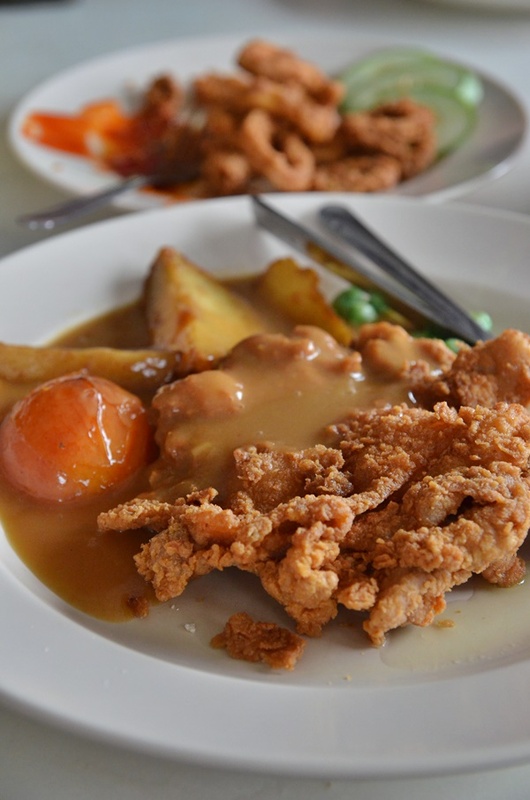 The trademark here is the quintessential Hainanese chicken chop; a fairly large cutlet of chicken thigh coated in crumbs and deep fried before being served with a generous ladle of brown sauce, with sides of boiled green peas, tomatoes and fried potatoes. While at some similar outlets, the Hainanese chicken chop drowned in the sweet and at times slightly sour gravy is rather soggy, Hua Mui’s version stayed crispy until the end. The portion was substantial enough to be a satisfying lunch. 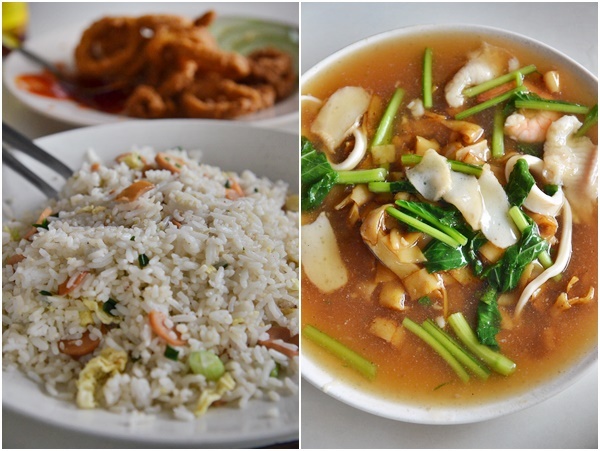 Hua Mui also serves a variety of traditional dishes like fried rice and noodles; Hainanese style of course. The noodles are usually doused in a moreish gravy while the fried rice comes in a variety of flavours as well. If you still feel famished from the journey (which may take up to two hours or more, depending on where you stay in Singapore), like I was, also due to the fact that I actually walked the entire bridge connecting both checkpoints instead of taking the bus (there was a village worth of folks on buses doing the same crossover that Saturday morning), then you are allowed to pile on a tad more calories. In my case, a side platter of deep fried squid rings and butter cream chicken; both fried to an irresistible crunch and would have been lovely with a gherkins-laden sour cream/mayonnaise dip but the bottled Lingham’s chilli sauce was a suitable alternative as well. Should you come much earlier and lunch is far from your mind, then try a platter of Hua Mui breakfast; consisting of sausages, fried potatoes, boiled green peas and tomatoes in the same Hainanese chicken chop brown gravy, an egg and a soft bun. Or their kaya and butter toast, coupled with a cup of steaming hot robust coffee. 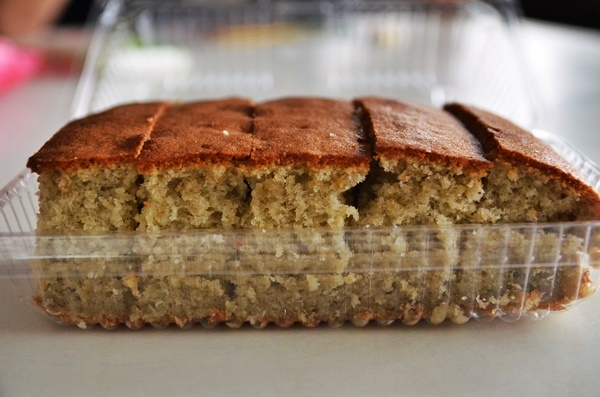 As the service can be a tad slow especially during the peak meal hours, you can walk a few hundred metres to Hiap Joo Bakery for their famous fluffy, fresh from the oven banana cakes. More often than not, you would have to stay in line and keep your fingers crossed that by the time it’s your turn, there would still be cakes to please your tastebuds. In our case, we were a lucky minute earlier than the ones behind us; we managed to buy the last two smaller packs (5 pieces each, the big ones come with 10 pieces each). They are also renowned for the coconut buns; although you may find the dough a bit too dry for your liking. To take a break from all the eating, we spent the next couple of hours in City Square and the newer Komtar JBCC next door; watching a movie and window-shopping or you can also go wild with the shopping although admittedly, the choices are not many. As the sun started to set, we ventured out to the downtown area again; this time to the food street named Meldrum Walk. Where one could die craving for a non-existent street food experience in Singapore where you can literally eat on the streets under the skies (save for Lau Pa Sat, but that’s a more of a tourist haunt than anything), over in JB, you can already find a back lane dedicated to such an endeavour near to the checkpoint. There are a few dozen stalls lining the dingy alley; populated by folks from the neighbourhood, across the straits and everywhere else in between. 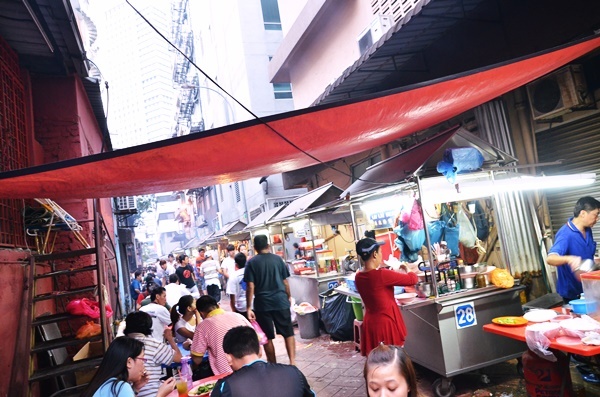 Follow your nose to the incredible smell of freshly grilled, fried and steamed street food; ranging from halal options like Ramly burgers and curry rice, to Chinese hawker fare like grilled fish, char kuey teow, wantan mee and grilled chicken wings. We parked ourselves near to Lai Lai Seafood stall; a chu char stall that can whip up a wide array of classic Chinese dishes from the simple fried rice and noodles to more elaborate seafood dishes. The chilli clams were delicious; a thickened gravy of sweet and spicy chilli sauce with egg ribbons complementing the small la-la clams perfectly, while the sweet and sour chicken was an appetizing choice as well. We also shared a large portion of Singapore fried bee hoon, fried egg omelette with bitter gourd and stir-fried sweet potato leaves with minced garlic. 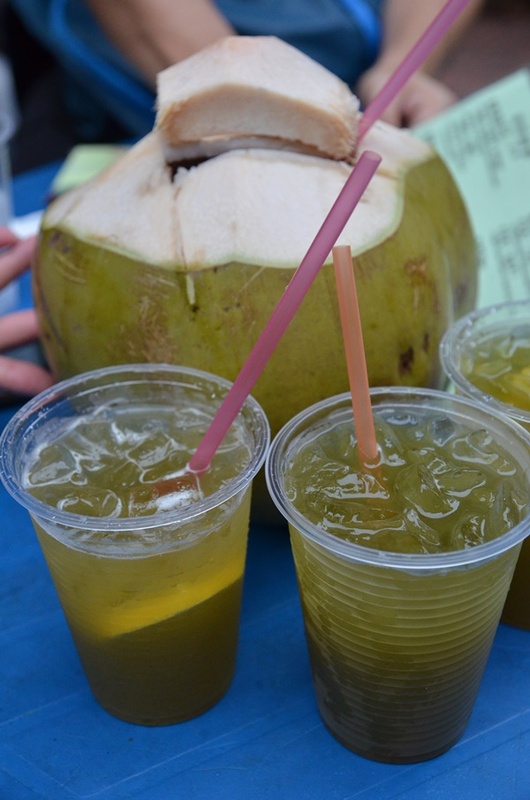 Cool down with some coconut water and sugar cane juice at Meldrum Walk hawker food street. The aroma of freshly grilled, honey-marinated chicken wings was too much to resist, thus we also braved the more than half an hour wait for a few pieces. Lastly, washing down all the grease and heat with fresh coconut or sugar cane juice. And that is my story of our JB day trip. 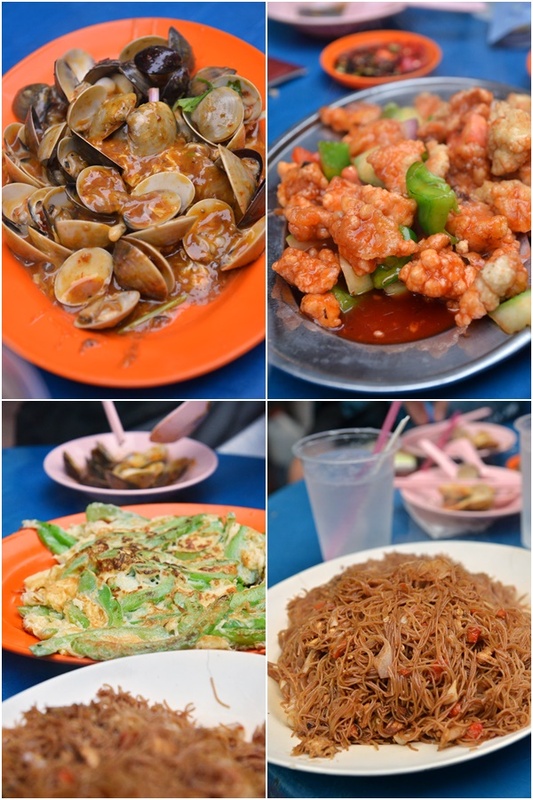 Of course, if you can afford the time, then you should stay a night in JB, explore the various eateries further from the checkpoint including the delicious San Low bee hoon, Muar otak-otak, mee rebus Stulang Laut and the JB special kuey teow kia.